Dr. Pulido received his Doctorate in Dental Surgery (D.D.S.) degree from University of Detroit Mercy School of Dentistry. 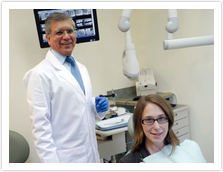 As a prosthodontist, Dr. Pulido is an ADA certified specialist in restorative, cosmetic, and implant dentistry. He completed a three year Advanced Prostodontics Residency Specialty Program at Indiana University School of Dentistry. He has been enriching his knowledge in general dentistry and oral rehabilitation with four dental degrees obtained in Colombia and the United States, where he has been living with his family for the past 17 years. Currently, he has a private office in Brick, NJ dedicated to General Dentistry and Prosthodontics. In addition, Dr. Pulido was a Clinical Adjunct Professor and Affiliate Assistant Professor in the Department of Restorative Dentistry at the University of Detroit Mercy School of Dentistry, a Bench Assistant Professor in the Department of Restorative Dentistry at the Indiana University School of Dentistry, as well as a Clinical Assistant Professor in the Department of Prosthodontics at the CIEO Foundation. As a professor, he was acknowledge by the class of 2010 and presented with the Outstanding Clinical Faculty Member Award in the Department of Restorative Dentistry at the University of Detroit Mercy School of Dentistry.